Greg Walters tapped to Reimagine "Managed Print Services"
Your Managed Print Services Association has asked former MPSA President and current MPSA Board of Director, Greg Walters, to lead the charge in redefining Managed Print Services. Greg will be forming a Blue Ribbon task force of MPSA members to collaborate in this effort. Greg is issuing a "call to arms" for all MPSA members interested in directing the future of the association, to volunteer and become part of the coterie. Reach out to him at greg@grwalters.com. "It's pretty simple. Everything the association takes action on, supports our definition. That's just it. It is OUR definition of the market. As the only, independent, free-thinking, non-profit association in our niche, it is our responsibility to lead into new and dangerous frontiers. Join us," adds Greg. Founded in 2009, the MPSA is a global, non-profit organization that provides independent communications, collaboration, education, standards and success MPS professionals. The mission of the MPSA and its members is to address and optimize business’ office document management while enhancing the growth, efficiency, and profitability of the MPS segment through advocacy, marketing, education, research, standards and a general community of interest. Greg Walters is an entrepreneur and founder of the notorious destination site, TheDeathOfTheCopier where he comments on all things imaging, the rise of managed services and the advance of business technology. A prolific writer and frequent speaker, Greg shares his passionate, unique—and provocative—view of technology and people addressing the digital impact on 21st century business, the new way of work and society. 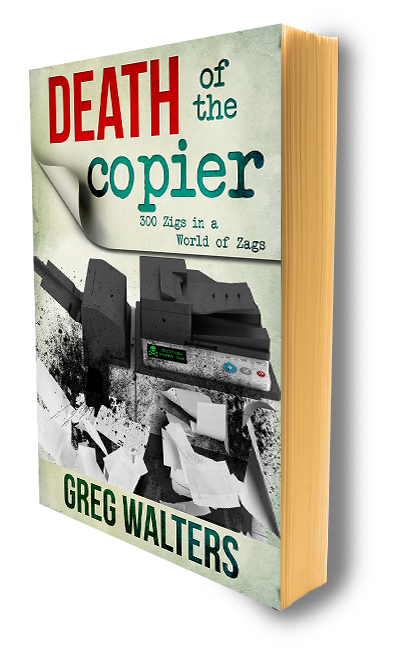 His book, Death Of The Copier, published in 2014, offers a controversial summary of the early days managed print services and the not so distant future of the hard copy industry. Greg is currently with a regional VAR, building an MPS practice within the IT Lifecycle model. He lives in Oconomowoc, Wi. Is Your IT Vision Hung Up on the Past?